But a Breitbart London analysis of over 200 images used by the BBC on its website shows a staggering 53 per cent of children as the focal points of images, with 36 per cent focused on the men, and just 10 per cent focused on women. By this measure, readers may assume that of the total number of sea arrivals, over 230,000 of them are children – an overestimation pushed by the BBC’s narrative of around 150,000. 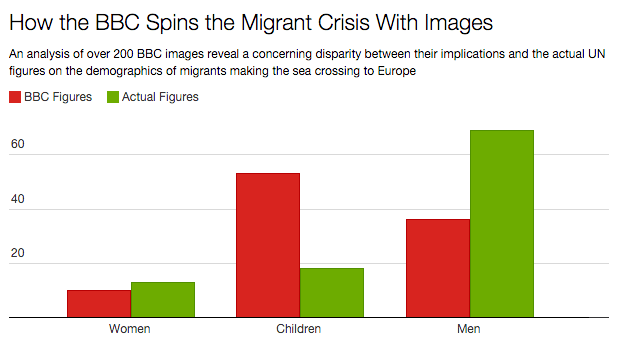 The skewed results will raise questions over the BBC’s coverage of the migrant crisis, alongside its obligation for neutrality, accuracy, and balance as set out in the BBC Trust’s Charter. The news comes as it was revealed that four in five of migrants logged by the European Union are not Syrian refugees, but rather, migrants from places as far apart as Afghanistan, Bangladesh and South Sudan. The news confirms fears that many migrants are lying about their backgrounds in order to gain refugee status in Europe. German authorities last week admitted at least 25 per cent of the migrants it has processed have lied about being Syrian citizens fleeing war. Rainer Wendt, head of the German Police Union: “Almost without exception, every refugee pretends to be a Syrian when in fact, many come from other countries, even from sub-Saharan Africa”. 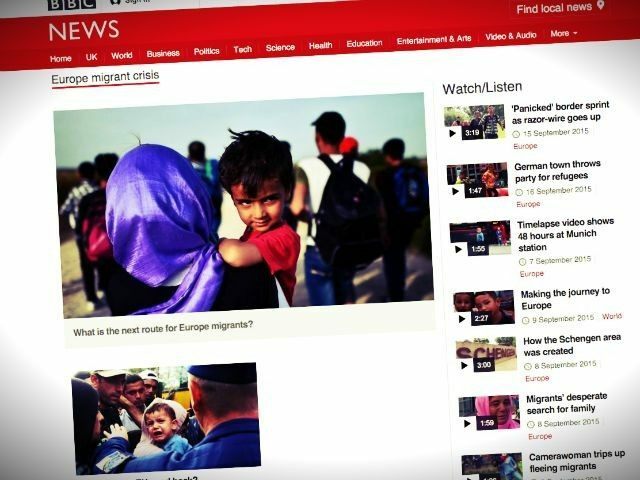 The BBC coverage tallies with the coverage by the Canadian state broadcaster, the CBC, which has seen a petition lodged against its coverage of the migrant crisis. Breitbart London analysed the top 229 images dated between September 15th and September 21st, identifying the images by their ‘focal point’ – women, men, or children. Where some images contained more than one, or all of the categories involved, Breitbart London counted the focal point of the image as the category, unless there was equal representation across the image, in which case it was disregarded. The images with equal representation numbered below 20, and it is worth noting a 1:1:1 ratio would still disproportionate to the actual statistics from the United Nations.